We know how much you love your Toyota T100 Pickup. But you can take your truck so much further when you invest in one of these Toyota T100 Pickup lift kits. They come with everything you need to customize your ride, giving you extra ground clearance and room for larger tires, so you’re not limited to just the main road. Your pickup was made for the great outdoors. From rugged mountains to soggy swamps and streams, nothing will be off limits for you and your Toyota T100. You can power through all kinds of terrain and avoid obstacles like nobody’s business. You’ll also need larger tires if you’re driving through the snow, ice or mud. 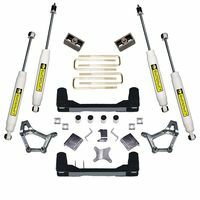 Make the most of your pickup truck and order one of these lift kits today!